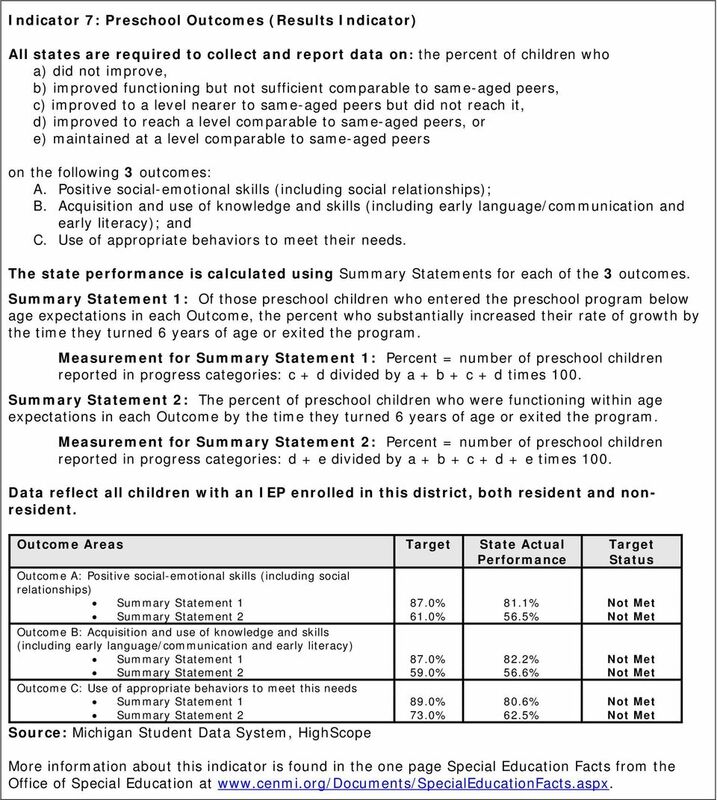 Download "Michigan Department of Education, Office of Special Education Michigan s State Performance Plan Annual Public Reporting"
1 Michigan Department of Education, Office of Special Education Michigan s State Performance Plan Annual Public Reporting All data reported are from Michigan s Annual Performance Report, submitted 2/1/2012. These data typically reflect the school year (July 1, 2010-June 30, 2011) except where noted. Indicator 1: Graduation (Results Indicator) The Indicator 1 data are from because the US Department of Education prescribed a one-year data lag for this indicator. All states are required to collect and report data on: the percent of youth with an Individualized Education Program (IEP) graduating from high school with a regular diploma. 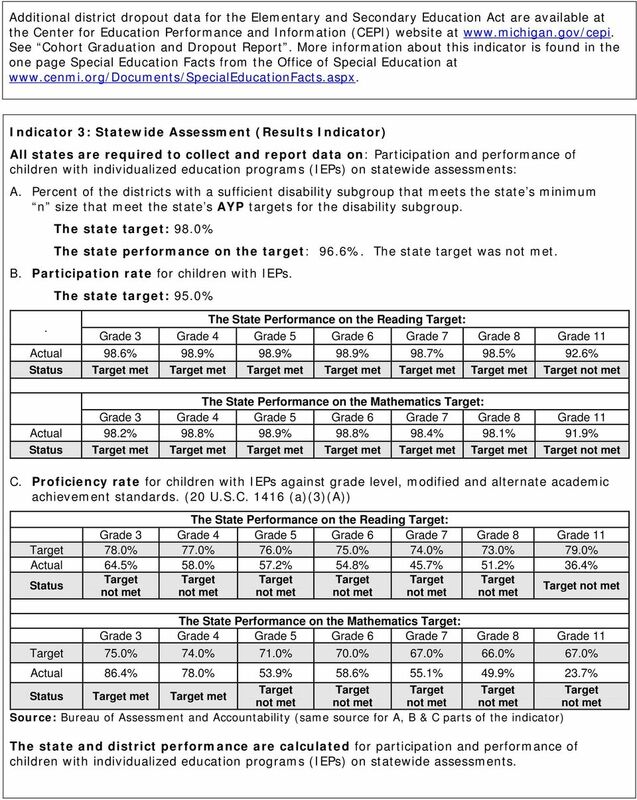 The state target: 80.0% The state performance on the target: 57.4%. The state target was. 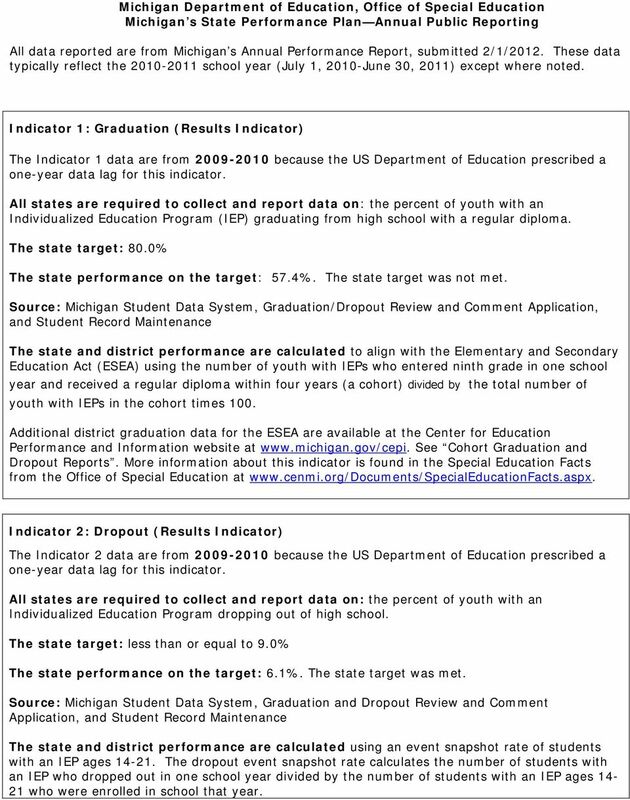 Source: Michigan Student Data System, Graduation/Dropout Review and Comment Application, and Student Record Maintenance The state and district performance are calculated to align with the Elementary and Secondary Education Act (ESEA) using the number of youth with IEPs who entered ninth grade in one school year and received a regular diploma within four years (a cohort) divided by the total number of youth with IEPs in the cohort times 100. Additional district graduation data for the ESEA are available at the Center for Education Performance and Information website at See Cohort Graduation and Dropout Reports. More information about this indicator is found in the Special Education Facts from the Indicator 2: Dropout (Results Indicator) The Indicator 2 data are from because the US Department of Education prescribed a one-year data lag for this indicator. All states are required to collect and report data on: the percent of youth with an Individualized Education Program dropping out of high school. The state target: less than or equal to 9.0% The state performance on the target: 6.1%. The state target was met. Source: Michigan Student Data System, Graduation and Dropout Review and Comment Application, and Student Record Maintenance The state and district performance are calculated using an event snapshot rate of students with an IEP ages The dropout event snapshot rate calculates the number of students with an IEP who dropped out in one school year divided by the number of students with an IEP ages who were enrolled in school that year. 2 Additional district dropout data for the Elementary and Secondary Education Act are available at the Center for Education Performance and Information (CEPI) website at See Cohort Graduation and Dropout Report. More information about this indicator is found in the one page Special Education Facts from the Office of Special Education at Indicator 3: Statewide Assessment (Results Indicator) All states are required to collect and report data on: Participation and performance of children with individualized education programs (IEPs) on statewide assessments: A. Percent of the districts with a sufficient disability subgroup that meets the state s minimum n size that meet the state s AYP targets for the disability subgroup. The state target: 98.0% The state performance on the target: 96.6%. The state target was. B. Participation rate for children with IEPs.. The state target: 95.0% The State Performance on the Reading : Grade 3 Grade 4 Grade 5 Grade 6 Grade 7 Grade 8 Grade 11 Actual 98.6% 98.9% 98.9% 98.9% 98.7% 98.5% 92.6% Status met met met met met met The State Performance on the Mathematics : Grade 3 Grade 4 Grade 5 Grade 6 Grade 7 Grade 8 Grade 11 Actual 98.2% 98.8% 98.9% 98.8% 98.4% 98.1% 91.9% Status met met met met met met C. Proficiency rate for children with IEPs against grade level, modified and alternate academic achievement standards. (20 U.S.C (a)(3)(a)) The State Performance on the Reading : Grade 3 Grade 4 Grade 5 Grade 6 Grade 7 Grade 8 Grade % 77.0% 76.0% 75.0% 74.0% 73.0% 79.0% Actual 64.5% 58.0% 57.2% 54.8% 45.7% 51.2% 36.4% Status The State Performance on the Mathematics : Grade 3 Grade 4 Grade 5 Grade 6 Grade 7 Grade 8 Grade % 74.0% 71.0% 70.0% 67.0% 66.0% 67.0% Actual 86.4% 78.0% 53.9% 58.6% 55.1% 49.9% 23.7% Status met met Source: Bureau of Assessment and Accountability (same source for A, B & C parts of the indicator) The state and district performance are calculated for participation and performance of children with individualized education programs (IEPs) on statewide assessments. 6 Indicator 8: Facilitated Parent Involvement (Results Indicator) All states are required to collect and report data on: the percent of parents with a child receiving special education services who report that schools facilitated parent involvement as a means of improving services and results for children with an IEP. The state targets: Children ages 3-5: 35.5% of families will rate their school at or above the 600 standard score. Students ages 6-21: 22.0% of families will rate their school at or above the 600 standard score. The state performance on the targets: Children ages 3-5: 58.7%. The state target was met. Students ages 6-21: 25.9%. The state target was met. Source: National Center for Special Education Accountability Monitoring (NCSEAM) Survey State and district performance are calculated using a survey of all parents of children receiving special education services ages three through five years and one-third of all parents of school age children receiving special education services ages six through twenty-one. The NCSEAM set a national standard score of 600. 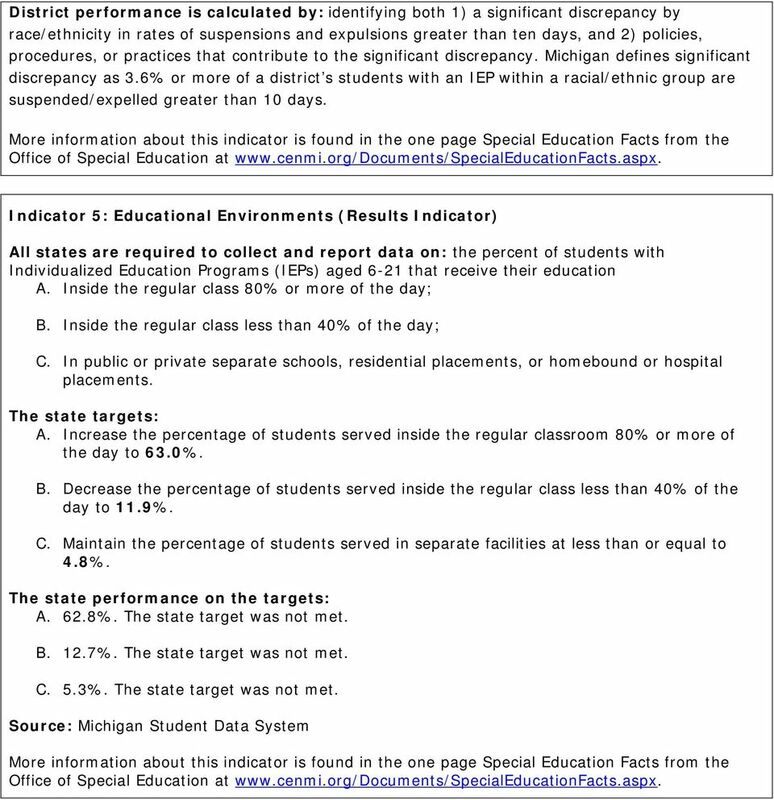 More information about this indicator is found in the one page Special Education Facts from the Office of Special Education at Materials are also available at the Wayne State University website: Indicator 9: Disproportionate Representation - Child with a Disability (Compliance Indicator) The Indicator 9 data are from and because a two-year pattern is required in Michigan. All states are required to collect and report data on: the percent of districts with a higher or lower than expected number of students with an Individualized Education Program (IEP) of any racial and ethnic groups that is the result of inappropriate identification policies, procedures or practices. The state and district target: 0% The state performance on the target: 0.2%. The state target was. 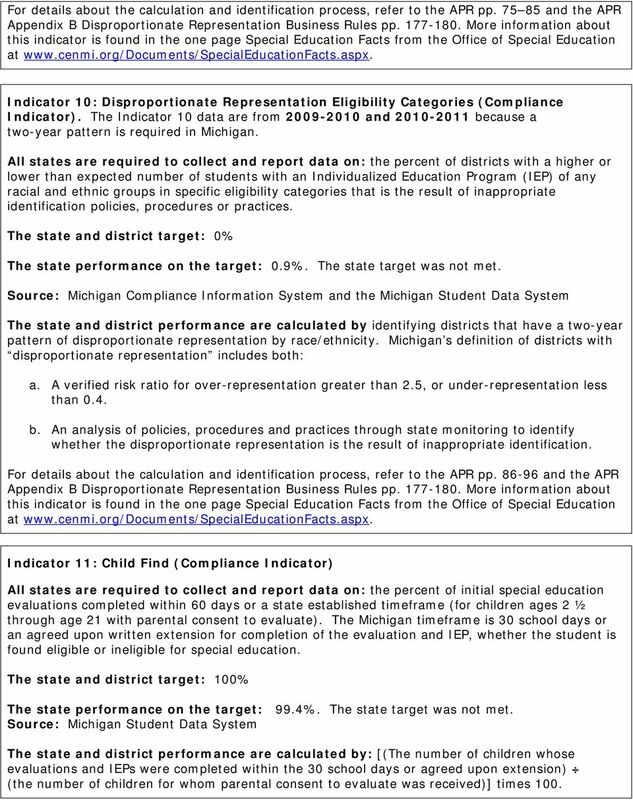 Source: Michigan Compliance Information System and the Michigan Student Data System The state and district performance are calculated by identifying districts that have a two-year pattern of disproportionate representation by race/ethnicity. Michigan s definition of districts with disproportionate representation includes both: a. A verified risk ratio for over-representation greater than 2.5 or under-representation less than 0.4. b. An analysis of policies, procedures and practices through state monitoring to identify whether the disproportionate representation is the result of inappropriate identification. 7 For details about the calculation and identification process, refer to the APR pp and the APR Appendix B Disproportionate Representation Business Rules pp More information about this indicator is found in the one page Special Education Facts from the Office of Special Education at Indicator 10: Disproportionate Representation Eligibility Categories (Compliance Indicator). The Indicator 10 data are from and because a two-year pattern is required in Michigan. All states are required to collect and report data on: the percent of districts with a higher or lower than expected number of students with an Individualized Education Program (IEP) of any racial and ethnic groups in specific eligibility categories that is the result of inappropriate identification policies, procedures or practices. The state and district target: 0% The state performance on the target: 0.9%. The state target was. Source: Michigan Compliance Information System and the Michigan Student Data System The state and district performance are calculated by identifying districts that have a two-year pattern of disproportionate representation by race/ethnicity. Michigan s definition of districts with disproportionate representation includes both: a. A verified risk ratio for over-representation greater than 2.5, or under-representation less than 0.4. b. An analysis of policies, procedures and practices through state monitoring to identify whether the disproportionate representation is the result of inappropriate identification. For details about the calculation and identification process, refer to the APR pp and the APR Appendix B Disproportionate Representation Business Rules pp More information about this indicator is found in the one page Special Education Facts from the Office of Special Education at Indicator 11: Child Find (Compliance Indicator) All states are required to collect and report data on: the percent of initial special education evaluations completed within 60 days or a state established timeframe (for children ages 2 ½ through age 21 with parental consent to evaluate). The Michigan timeframe is 30 school days or an agreed upon written extension for completion of the evaluation and IEP, whether the student is found eligible or ineligible for special education. The state and district target: 100% The state performance on the target: 99.4%. The state target was. 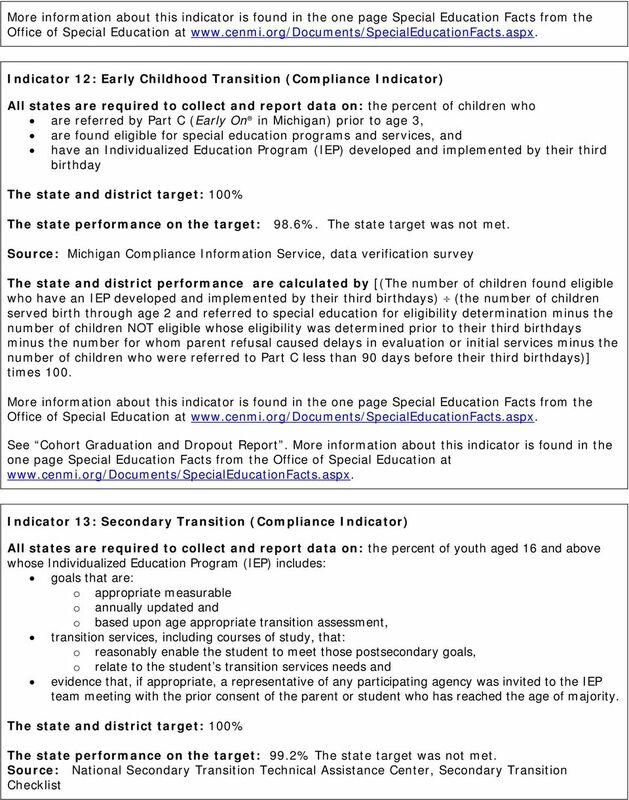 Source: Michigan Student Data System The state and district performance are calculated by: [(The number of children whose evaluations and IEPs were completed within the 30 school days or agreed upon extension) (the number of children for whom parental consent to evaluate was received)] times 100. 9 The state and district performance are calculated by: The percent = [(# of youth with IEPs aged 16 and above with an IEP that includes appropriate measurable postsecondary goals that are annually updated and based upon an age appropriate transition assessment, transition services, including courses of study, that will reasonably enable the student to meet those postsecondary goals, and annual IEP goals related to the student s transition service needs. There also must be evidence that the student was invited to the IEP Team meeting where transition services are to be discussed and evidence that, if appropriate, a representative of any participating agency was invited to the IEP Team meeting with the prior consent of the parent or student who has reached the age of majority) divided by the (# of youth with an IEP age 16 and above)] times 100. Indicator 14: Postsecondary Outcomes (Results Indicator) All states are required to collect and report data on: the percent of youth who are no longer in secondary school, had an Individualized Education Program (IEP) in effect at the time they left school, and were: A. Enrolled in higher education within one year of leaving high school. B. Enrolled in higher education or competitively employed within one year of leaving high school. C. Enrolled in higher education or some other postsecondary education training program; or competitively employed or in some other employment within one year of leaving high school. The state targets: The percent of students with an IEP: A. Enrolled in higher education is at least 34.3% B. Enrolled in higher education or competitively employed is at least 58.4% C. Enrolled in higher education or in some other postsecondary education or training program; or competitively employed or in some other employment is at least 71.4% The state performance on the target: A. 31.7% in higher education B. 53.0% in higher education or competitively employed C. 67.1% in higher education or in some other postsecondary education or training program; or competitively employed or in some other employment Source: National Post-School Outcomes Center Survey The state and district performance are calculated by using: the National Post-School Outcomes Center s Postsecondary Outcomes Survey to collect information from former students who had exited school (graduated, dropped out, or received a certificate of completion) in the previous academic year. Number of youth who are no longer in secondary school, had an IEP in effect at the time they left school and: A. were enrolled in higher education within one year of leaving high school divided by the # of respondent youth who are no longer in secondary school and had an IEP in effect at the time they left school. B. were enrolled in higher education or competitively employed within one year of leaving high school divided by the # of respondent youth who are no longer in secondary school and had an IEP in effect at the time they left school. 160-5-1-.15 AWARDING UNITS OF CREDIT AND ACCEPTANCE OF TRANSFER CREDIT AND/OR GRADES.